Did a trade with DANTHEMANDOTCOM. Got a package some days ago all the way from alaska to Germany. This was the content of the box. I totally could recommend trading with Danny. He's a very nice guy. 2 FSR, some MRE's and some nice extras. I sent hm a package too, with some german EPAS and a french RCIR. Unfortunately he did not recieved his package so far. Don't know if something has gone wrong with the shipping. Hope that he will get his box very soon. Never had shiping problems before. I ordered a case of Dutch rations from Germany, and it magically disappeared for 3 weeks before appearing. Have hope, it may still be coming through. I started a research at DHL site now. Never had problems before with shipping. Just got my package from DANTHEMANDOTCOM, he is definitely THE MAN!! Even got a freebee, BOOYAH!!! Just got a package from DANTHEMANDOTCOM, great guy to deal with would recommend anytime. Re: Feedback - thanks guys! I can't begin to express how much generosity, kindness, selflessness and brotherhood these two fellas have shown me. I try to uphold the standard by which they have both set, albeit in my own hobo sort of way lol. These guys have CONTINUOUSLY blown my mind and have literally had me exclaiming out loud with many a "DUDE!! MAN!! BRO!! NO WAY!!! BY GAWD!!" and the like EVERY time I get a package from them. It's truly like Christmas the whole year round, even though I've only been an active member since about mid-summer, I honestly feel like I've been here for years. These two guys have been my biggest role models and mentors, and are always gracious in answering whatever rookie/noob questions I may hit them with. In that regard I must also thank Btemple for sharing his knowledge and know-how, and also for throwing me a bone or two in the form of shoutouts on his YT channel. I've had the pleasure of dealing with Drew and Steve since I first joined the forum and Brent I first heard about from our mutual 'Ol Mate'Dropbear and "met" very soon there after. I appreciate and respect the hell outta these guys, and would take a shin kick or airsoft bb/paintball to the neck for them. Drew and Steve have gone well out of their way, above and beyond in their dealings with me, and the level of generosity they've displayed is so great I fear I may never be able to pay it back in kind, but I will do my damned best to try. Drew, Steve, words will never suffice to show just how much I appreciate you both. And Brent, I respect the hell outta your character and am incredibly honored to count the three of these guys as friends and brothers in rations (and others I've also mentioned in previous feedback posts as well, I haven't forgotten you all too) Godspeed, and God bless buds. "The North remembers" seems to be a fitting quote indeed...THANK YOU fellas! ... many times over. You're an awesome guy, a truly great addition to our community! Thank you for the very kind words! Received a box of Polish rations from Delicious today. Packed well and it arrived slightly ahead of schedule. Thanks for the bonus Polish chocolate, too! Drew and Thor are two stand up guys..you certainly can never go wrong purchasing individual rations or ration boxes from them! 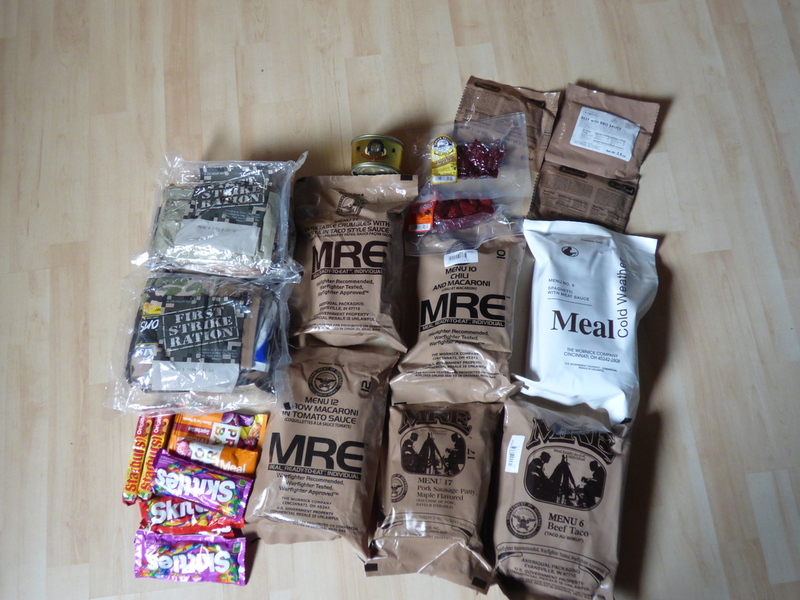 I could only afford a few items from Drew like a Korean spicy beef single meal pack, a MORE and a handful of assorted loose MRE items. During our convos I mentioned that I’d love to get my hands on some Asian snacks. Dude threw in fish jerky, shrimp crackers, you name it..all as freebies! He goes above and beyond every single time! Now I definitely don’t expect this with every order but damn is it appreciated! Thank you so much! And thortof has fresh Danish 24 hour rations at excellent prices, shipped fast! I have absolutely nothing but positive words to say about both men. Thanks again guys!